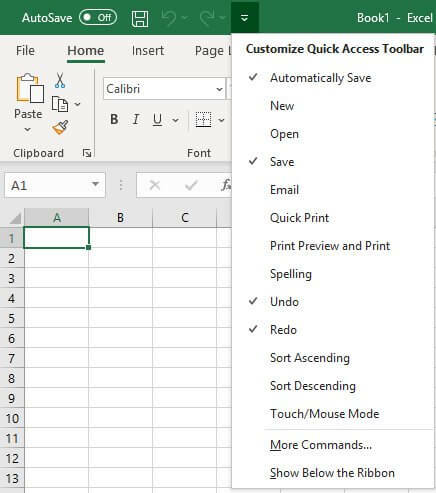 Microsoft Office provides a neat little toolbar called the Quick Access Toolbar or QAT. 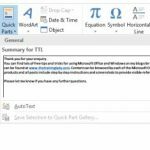 Microsoft Access, Excel, Outlook, PowerPoint and Word all have this useful feature. 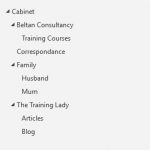 The toolbar allows you to customise and add commands within the program onto a toolbar which can be accessed regardless of which tab you are working in within the Ribbon. Each applications’ toolbar is individual so if you customise the toolbar in Word, the same changes will not be present in Excel. You will need to customise each one individually. The Quick Access Toolbar can be displayed in two different locations within each application. By default, it is shown in the top left corner of the application, above the Ribbon area. You also have the ability to move the toolbar below the Ribbon area which gives you the advantage of a wider area to display command buttons in. The Quick Access Toolbar is a huge time saver as it removes the need for you to switch between multiple tabs on the ribbon when working with features you use frequently. Instead, add them to the toolbar for quick and easy access. There are three methods available for customising the Quick Access Toolbar, I personally tend to use method 3, however, pick the one you prefer and get customising! 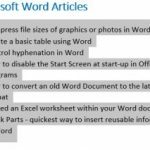 Microsoft Office provides you with some suggested commands you may use on a regular basis which can be added into the toolbar or you can browse through all commands within the application and select the ones you wish to include. The buttons will appear in the order that you select them; you can change the order as shown later in this post. The final method is using the right mouse click option. One important tip I give when showing people how to customise the toolbar is not to put too many commands on the toolbar. Not only does it make the toolbar very wide but it means that instead of giving you a time-saving feature you will end up spending more time scanning through the commands shown to find the exact one you are after. I suggest up to approx. 12-15 commands are great, many more than that and you will potentially be counter-productive. If you decide you wish to remove items from the toolbar, simply right mouse click the command icon and select Remove from Quick Access Toolbar. My last great tip is the ability to import/export any customisations you have made on your toolbar and use them on different computers. 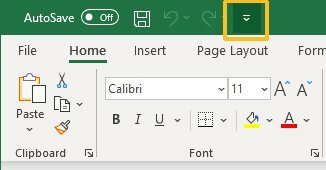 If you wish to customise the toolbar and use the same customisation across multiple computers then you can simply export a customisation file, copy the file to a USB or network drive, then import the customisations into another copy of Microsoft Office. If you export all customisations then ensure you save the file to a location you will be able to find, such as the Desktop. You can then transfer the file to a USB, network drive or email the file to be accessed from another computer. To import simply open the application on the other computer, click the drop-down menu for the Quick Access Toolbar and select More Commands. Click the Import/Export button and choose Import customization file, navigate to the file and select it. A warning message will be displayed alerting you that all current customizations will be replaced if you are sure click Yes. The customisation will now be imported. I hope you have enjoyed this post about using the Quick Access Toolbar. 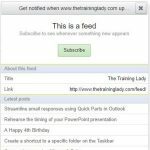 This is a very popular topic in any of my training courses so be sure to check out this great time-saving feature. For more time-saving ideas, check out my series of favourite keyboard shortcuts for Excel, Outlook, PowerPoint and Word.